Ultra HD Blu-ray, as the name suggests, it supports 4K Ultra HD, which offers about 8.3 million pixels - that's four times what you get in Full HD/1080p. When you cram more pixels into the same sized TV screens, you get a sharper, clearer picture. It's not just about sharpness, either. UHD Blu-ray also adds all sorts of useful things like High Dynamic Range (HDR) and new-gen audio standards like Dolby Atmos. HDR is a new standard designed to deliver a wider range of colour, brightness and contrast, in theory taking the picture a lot closer to what our eyes are capable of perceiving. Dolby Atmos, meanwhile, is an audio upgrade, essentially offering more subtlety and location precision to sound effects. Sadly, Ultra HD discs won't play on a normal Blu-ray player, though you can play older Blu-ray discs on an Ultra HD player. In order to get a true 4K experience, remember that you'll need an Ultra HD Blu-ray player, an Ultra HD TV and some discs, obviously. There are a few important caveats, though. First, you'll need to make sure your TV supports at least the HDMI 2.0 standard. Most TVs from the last year or so will, but very cheap models and some models from 2014 or earlier might not. Check your manual or Google the model number to find out - the even newer HDMI 2.1 standard should also be fine. If you don't have a 4K TV, your 4K Blu-ray player will still work, but it will only display images in 1080p. Buy a regular Blu-ray instead of a 4K version and it will still play in 3840 X 2160 resolution, but it won't be a native 4K image and will be noticeably different than had you used an Ultra HD Blu-ray. There's no denying Ultra HD Blu-ray and 4K TVs are luxuries, but they're luxuries worth having. And if you want the absolute best possible picture from your 4K TV, Ultra HD Blu-ray is where you'll find it. What if you have no 4K Blu-ray Player or have no plan to buy one? Don't worry! There are always solutions out there. You can use a Blu-ray ripping tool to rip/convert 4K UHD Blu-ray to digital files for streaming to 4K TV without needing a 4K Blu-ray player. In fact, there are many Blu-ray ripping tools on the market that can deal with common Blu-ray discs. However, when it comes to dealing with 4K Blu-ray discs, many Blu-ray rippers fail to rip it cause a 4K Blu-ray has higher and stricter encyption and normal Blu-ray decrypter cannot bypass all the copyright protection. Feel frustrated? Don't worry! There is still one 4K Blu-ray ripping tool that can offer nearly perfect work to handle UHD 4K Blu-ray Rippers. The tool we highly recommend here is called EaseFab LosslessCopy (available for Windows and Mac users), which can rip, convert and copy 4K Blu-ray discs seamlessly and losslessly. Every commercial Blu-ray disc contains what's called a disc image (or ISO file). Which is essentially the blueprint for a disc. It contains the all of the videos, audio, menus, bonus tracks and file structure needed to play a disc in a Blu-ray player or drive. The best 4K Blu-ray Ripper scans your discs for its ISO file, extracts it and saves it onto your hard drive in digital format such as popular MP4, MKV, AVI, WMV, etc. 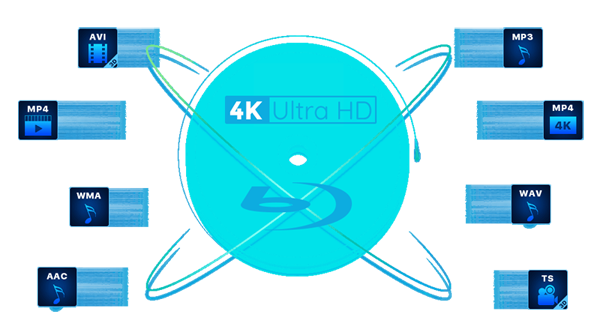 A 4K Blu-ray disc will be 50GB - 100GB. Full copy 4K Blu-ray disc to hard drive will take too much space. EaseFab LosslessCopy can directly extract the M2TS file which is the main title movie in the 4K Blu-ray without preserving other extras. Besides, you can also use the UHD Blu-ray Ripper to entire copy the 4K Blu-ray disc to a folder devided into BDMV folder and CERTIFICATE folder, making an exact copy, indistinguishable from the original. This way can contain the reviews, ads, subtitles, extras and other everything in the 4K Blu-ray disc, no any loss. Besides creating an exact 1:1 copies of 4K Blu-ray disc, LosslessCopy can also export almost all popular video formats like MP4, AVI, MKV, WMV, MOV, FLV, M3U8 formats for more convenient playback. It even can create 3D SBS/TB/Anaglyph MP4, 3D MKV, 3D WMV for Daydream View, PS VR, Gear VR, VR Box 2.0, Oculus Rift CV1, Oculus Rift DK2, HTC Vive, etc. What's more, EaseFab LosslessCopy can rip 4K Blu-ray to HEVC MKV, H.265 MP4 keeping 4K resolution. Normally, Blu-ray contains DTS, AAC, Linear PCM (LPCM), Dolby Digital (DD), Dolby Digital Plus (DD+), Dolby TrueHD, DTS Digital Surround, DTS-HD High Resolution Audio, DTS-HD Master Audio. The best 4K Blu-ray Ripper can allow you to rip 4K Blu-ray keeping DTS-HD Master Audio, DTS Digital Surround, etc audio. If you want to keep menus, chapter selection, subtitles and extra audio tracks when converting 4K Blu-ray to digital files, LosslessCopy can rip 4K Blu-ray to lossless/uncompressed MKV container. LosslessCopy also remux it to mkv format. This way you will get a huge, but unprotected, easy to use and store mkv file that contains the exact video and audio streams as your Blu-ray disc quality and size-wise. Sometimes you don't want or need everything on a 4K Blu-ray disc. The award-winning 4K Blu-ray ripping program allows you to pick and choose which video codec, resolution, bitrate, frame rate and audio codec, channel, bitrate, subtitle track, video aspect ratio to output. This is a good feature if you need to compress 4K Blu-ray to 1080p video for HD display or load 4K Blu-ray onto a smaller external hard drive. It should be time-consuming to rip a 4K Blu-ray disc to hard drive, especially encoding 4K Blu-ray to HEVC codec video in that HEVC encoding is GPU-taking. We found it takes up to five hours to complete a full disc-to-disc copy. Similarly, compressing a 4K Blu-ray movie to fit onto a normal media player can take up to 8 hours. This is true no matter what 4K Blu-ray copy software application you choose. EaseFab LosslessCopy have joined 30x realtime 4K HEVC encoder with NVIDIA CUDA hardware acceleration. On the condition that your computer is geared with a CUDA-enabled GPU, you can re-encode 4K Blu-ray to H.265 and H.264 video up to 30x times Blu-ray ripping speed which can massively reduce the while 4K Blu-ray ripping time. In addition, when you choose to entire copy 4K Blu-ray to folder, LosslessCopy can batch copy multiple 4K Blu-ray discs. Copying Blu-ray discs is a technical and often confusing process. The best 4K Blu-ray copy software distills the process down to its simplest form. The intuitive even childlish interface makes each person know the meaning of each button and the next step. Just load your 4K Blu-ray movies into the 4K Blu-ray decrypter. Choose the desired format then you can start the process. You can simply finish 4K Blu-ray ripping and copying withink 3 clicks. How to use LosslessCopy to rip, convert and backup 4K UHD Blu-ray discs? Step 1: Insert the 4K Blu-ray disc to the BD drive and then click the Load Disc button to have Blu-ray/DVD movies uploaded to EaseFab LosslessCopy. You can also import BD/DVD ISO files, IFO files or Blu-ray/DVD folder for conversion. 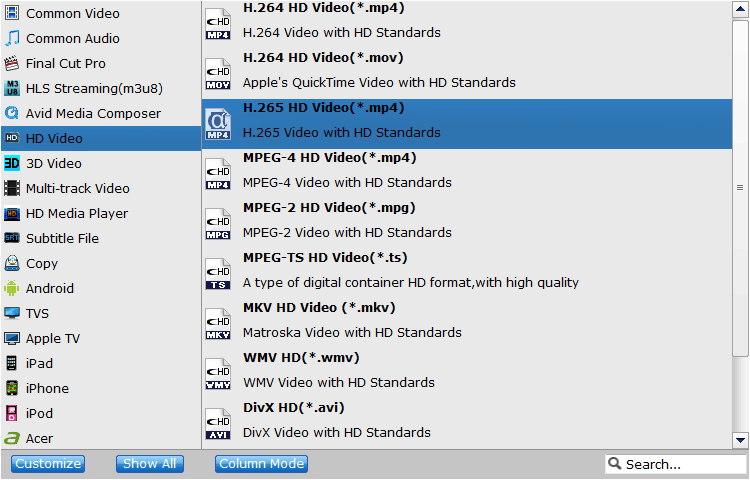 Step 2: Click on Format bar, select "Common Video" from the format list and in submenu you can find "H.265 Video(*.mp4)". The hit on the small folder icon to specify an output folder. Tips: If you want to do some advanced settings, you can click "Settings" icon to adjust the video, audio parameters bitare, frame rate, sample rate, audio channel, etc. Plus, you can click "Edit" button to do some editing work cropping, trimming, settings effect, adding subtitles. Step 3: Click "Convert" button and the program will rip Blu-ray movies to H.265 mp4/mkv video immediately. You can easily find the output files in the output folders once the conversion is done.